traditionnels d’imposition dans un monde mondialisé. international tax competition between nations and between businesses hadn’t been studied globally, Brigitte Alepin met up with Daniel McMahon, President executive officer of l’Ordre des CPA in Quebec to ask him to join her initiative to implement the first global conference about tax competition. He agreed to. In 2013 and 2014, Brigitte Alepin travelled the world to talk to international organisations and tax policy leaders about TaxCoop and seize their appeal. Once tax policy leaders from the OECD and the UN had confirmed their official participation, TaxCOOP was launched. TaxCoop 2015 was introduced in Montréal at the Montreal Museum of Fine Arts and was a great success. Never has a conference about taxation been so popular in Canada. Tax COOP 2016 was presented at the World Bank on May 23rd and on the 24th in Washignton. This conference was also a great success. TaxCOOP 2017 was presented to the United Nations in Geneva on October 16, 2017. This is the first major tax conference presented to the United Nations. On 15 December 2017, TaxCOOP was ranked on the prestigious Global tax 50 of the most influential personalities and organizations in the world in taxation. This is the only conference on this prestigious list. 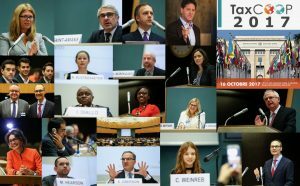 TaxCOOP 2018 is presented on 2-3 October 2018 at OECD headquarters on the occasion of the Paris Conference.